We are getting excited about our trip home in just a little less than a month! Talking with my children and grandchildren by Skype even makes us more eager to get back home and spend some time with family. Especially when we are talking with Meredith and Sean and realize that her due date is just a couple weeks away! We can’t wait! But… we are not ready yet. My spring schedule is packed and so I’m running around trying to get everything done before we head back at the end of the month. I just finished teaching Research and Writing for Biblical Counseling. This was my first time teaching this Master’s level class. We’ve taught a similar class on the Bachelors’ level for the last 5 years. But I had to totally re-work this class and add a number of examples and research related to Biblical Counseling. The class was one week, from 8:30 each morning until 6 pm each evening. I was definitely tired but I felt really good about what the students were able to accomplish in 1 week. I will still have their final Case Studies (research papers) to grade in about a month. But overall, the class was very helpful and I know it will be a benefit to many for years ahead in their ministries. The director has already asked if I would teach it again next year. One of the best parts for me in this class was getting to try my Russian skills. I felt very comfortable even though I made many mistakes. Most of the time, the students understood what I was saying. It is also such a blessing to be able to listen to questions and carry on conversations without the help of a translator all the time. (Just to be clear — I use a translator for lectures and probably will for many years to come). But it is nice to be able to carry on conversations without needing to have everything translated for me. As I have said many times, I can see why missionaries commit to a minimum of 2 years of language school before beginning any ministry. I am very grateful for the Russian classes I have had the last 1 1/2 years! I wish I had time for more (I need it)! Right after this seminar, I have another class to teach in the Church Planting and Pastoral Ministries Programs at Kyiv Seminary. The class will also be similar to the seminar, on the Theology and Practice of Prayer. But it will be the entire week rather than just a weekend and will cover many other topics. I will be trying to prepare for this class also. Right after the class ends of Friday, we have to pack on Saturday and be at the airport on Sunday morning at 5:00 am! But I will still be working on another class that I won’t be here to teach this year: Research and Critical Thinking for the Bachelor’s level. I’m re-doing the class to fit into our new one-week schedule and that means revising all the lectures and PowerPoints. I’ve already been working on this with Nataly Tereschenko but we still have a number of lectures to finish working on. Since I won’t be here to teach in May like usual, Nataly is going to teach the class herself with the help of my translator, Oksana Pro, who has translated the class for us for the last 4-5 years. Pray that we can have time to make all the necessary revisions and that everything will go smoothly for them as they teach this May. That brings us to heading home… soon! We arrive the end of March but we will be in the Little Rock area only a day before we head up to Fayetteville to help Sean and Meredith with the new baby! We plan to come back to the Little Rock/Cabot area most weekends so we hope to see many of you at church. But we are also planning to have 3 “get-togethers” in April where people can come by and say hello because we don’t have a lot of time to see everyone like we want to. In May, we will head to Florida to see Joel and Alyssa, my father, and Debbie’s parents as well as some other dear friends who now live in Florida. We are also hoping to have some time for relaxing a little too before we head back to Ukraine the first week of June! As to prayer needs, our biggest need is for a car. We need something economical and reliable that we can use for ministry as well as for our family. We’ve already had a couple of people give gifts to help us with the car and we now have $4000. From what other missionaries have told us, we will need at least $10,000-15,000, depending on what we can find available. Be praying for this need. If you want to help, you can designate your gift to 1700-Car Fund. Also, continue praying for Katya as she will be in her final trimester during our time in the states. She is due the middle of July. Kristina is doing great, learning rapidly and running around almost as fast! The situation in Ukraine is currently relatively quiet, because we technically have a “ceasefire.” Basically, this means Russia is resupplying its troops for the next offensive but it certainly does not mean that the Russians have “ceased firing.” On the frontlines, Russian and pro-Russian soldiers are attacking every day and Ukrainian soldiers are dying daily too. Pray for them as they defend Ukraine and pray for those who minister to them (we have a number of people in our church helping with the military and the refugees). The biggest problem right now is the economy. Ukraine is facing massive devaluation of its currency (it was 9 UAH to 1 USD last spring; it is now almost 30 UAH to 1 USD). Along with the devaluation of currency, we are also seeing close to hyper-inflation. Many prices have more than doubled in the last month alone. One economist projected Ukraine’s inflation at 272% for this year! I’m not an economist so I don’t know what those figures really mean. But I know that the average Ukrainian is making 1/3 less and paying 2-3 times more! For us as Americans, the currency devaluation balances out most of the inflation right now. But for Ukrainians, it’s devastating! I don’t know how they survive. 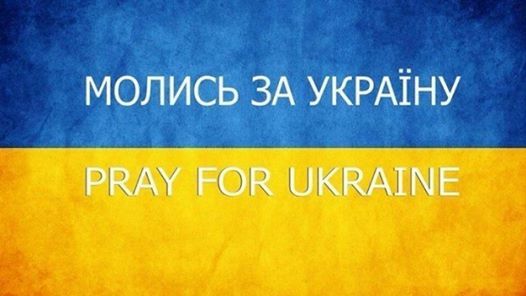 Please pray for the economy and for the people of Ukraine. Also pray that the churches of Ukraine can be lighthouses of hope during these difficult days.